Of course, this is what we’d all like to do. Fortunately, when you have a new baby, there are many ways to get items for free. Take advantage of all the inevitable offers you will get for hand-me-downs from friends and family members. You can upfit the items by giving them a good wash, paint where needed, or add new embellishments. Many times, you won’t have to do anything since the items will be in such good condition. Another option for finding free goods is to look at Freecyle, an online recycling community in which members give away unwanted or unused household goods. You can even post “wanted” ads. Goodwill, Craigslist, thrift shops, and yard sales are great places to find items for babies and young children. Children outgrow their things so quickly that parents don’t have much else to do with them besides give them away. Items will still be in good condition, and most likely not more than a few years old (meaning that some trends may still be holding up). The best part is that you’ll get items at a fraction of the cost. They are a bit more expensive on the front end – materials cost more and you have to buy pails and cleaners – but they will cost far less than disposable diapers in the long run. Disposable diapers will have to be changed more times than you think possible in a day, and you’ll end up spending hundreds in a few short months. Cloth diapers are no more messy than disposable diapers; they just require more upkeep. It’s better for your baby, and it costs far less than formula. In fact, it costs nothing. 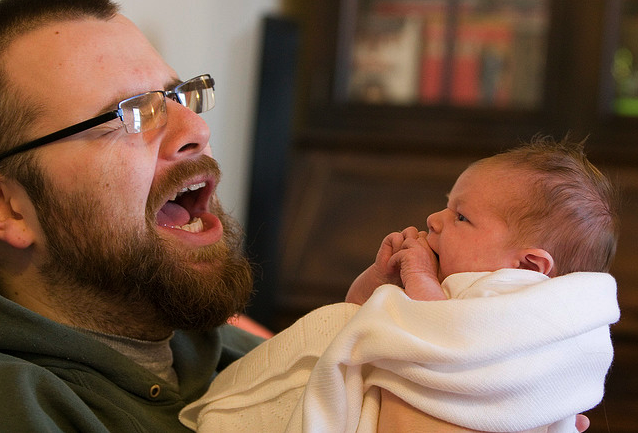 (Obviously, you dads can’t breastfeed, but you can encourage your partners to do so.) Formula can also cost hundreds or thousands of dollars over a short period of time, and it contains chemicals and additives that can be harmful to your baby. Breastfeeding is free (unless you need to buy a breast pump to go back to work), and it allows you to be sure of what you’re feeding your baby. Many, many companies offer coupons, discounts, and other deals to new parents. Take advantage of these deals, and sign up for newsletters or other e-mail clubs, which can entitle you to exclusive savings and giveaways. Sign up for the major daily deal providers like Groupon, Dealicious, DealFind, WebPiggy and EthicalDeals. There’s no shame in getting something for half price, especially when you were going to buy it anyway. Finally, many costly baby items such as custom clothing or décor can be made if you have a little imagination and some crafty skills. Even if you are a relative beginner, you can modify or upfit items to your liking: add applique to onesies for cute customs, paint furniture for your own unique look, or make your own wall hanging with cloth or construction paper. If you really don’t know where to start, look for tutorials online or in craft books. What other ways have you found to save money when welcoming a new baby? Have any of these tips worked for you? Send us your money saving tips and we just might publish them here on HeadsUpDad. Maria Rainier is a freelance writer and blogger for First in Education where she’s recently written about material scientist careers along with a guide to online electronics technology programs. In her spare time, she enjoys yoga, traveling, and working with origami.